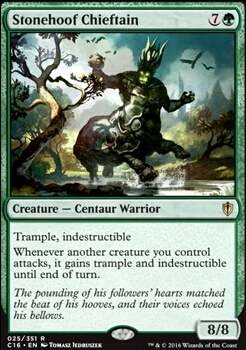 Whenever another creature you control attacks, it gains trample and indestructible until the end of turn. this is great, I'm so gonna make one of these, just with more clones and less of other stuff, so you are literally playing their deck with your cards, ecept for Stonehoof Chieftain which is a game ender once you have copied some huge creatures. by the way, this deck needs Alchemist's Refuge , you can replace a basic mountain for it, since the deck needs very little red. Alchemist's Refuge is a budget Vedalken Orrery which lets you cast Rite of Replication on the player's endstep right before your turn on your Biovisionary , winning you the game right there. Malignus + Stonehoof Chieftain / Void Winnower = This combo will essentially give Malignus evasion. Void Winnower + Ruric Thar, the Unbowed / Temur Sabertooth = My favorite targets for a control/boardwipe heavy meta. Eternal Witness + Temur Sabertooth = A recursion combo in a slower meta where I can have e wit get tooth and nail back for more tutoring. Worldspine Wurm + Archetype of Endurance = Forces opponents to deal with Wurm via boardwipe. There's more combination that I've used but those above are the common ones. As far as Rhythm of the Wild goes, I'm not convinced that it is good in this deck because Xenagos already provides haste and is hard to remove. Also this deck doesn't really care if creatures get countered since I run a redundant amount of fatties. I always find that my Thantis, the Warweaver deck ran into issue of not being able to play defense and my creature getting killed in combat so I did a few things to fix that. I like all the walls as a way to keep you from attacking but when you do have to attack there are a few cards that help you survive. Akroma's Memorial is amazing. Bow of Nylea usually means they don't get blocked by the bigger creatures. Dolmen Gate and Stonehoof Chieftain make them survive combat anyway. 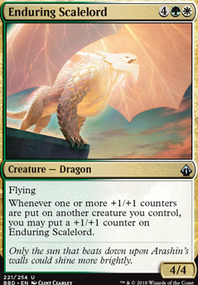 Sight of the Scalelords may also work to make your creatures stay back on defense. 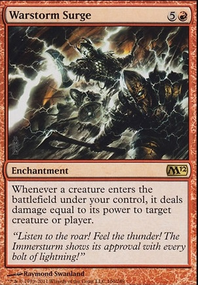 As for fun cards to add, I really enjoy my Assault Suit in this deck and Vaevictis Asmadi, the Dire is great removal and a fun political card. I know you want to get attacked so you can play "traps" to stay on flavor so Nemesis Trap , Slingbow Trap , and Stone Idol Trap seem to fit. You may also think about Baloth Cage Trap , Cobra Trap and Needlebite Trap . As an additional comment I will mention that if you need to stop getting attacked No Mercy and Dread keep people away. I actually don't know if I prefer Dolmen Gate or Stonehoof Chieftain but in my experience this is a very fast deck so Dolmen gate is probably better. Definitely worth an include if you're going for a creature-heavy build. Having 0 interaction or protection outside of creatures, you should def put in that Prowling Serpopard and Spellbreaker Behemoth . Soul of New Phyrexia protects all your creatures from a board wipe. 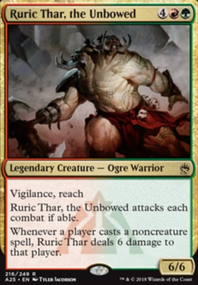 Ruric Thar, the Unbowed punishes control players. Duskwatch Recruiter Flip is a fantastic mana sink (as is Genesis Hydra ). Treasure Keeper and Woodland Bellower could be interesting? And Conduit of Ruin makes everything cheaper while tutoring for Decimator of the Provinces , Mockery of Nature , Nullstone Gargoyle , etc. Spearbreaker Behemoth and Stonehoof Chieftain also give some protection. Mistcutter Hydra , Craterhoof Behemoth if you have a decent amount of creatures, eldrazi titans like Ulamog, the Infinite Gyre , Kozilek, the Great Distortion , etc. Omnath, Locus of Mana will hold the mana as you swing, Eldrazi Conscription for a massive pump, Primordial Hydra , Stonehoof Chieftain , Tooth and Nail to tutor with.